The Interfolio team is off to a racing start this year. We have been hard at work, listening to our clients’ direct feedback and keeping a pulse on the needs of faculty members and academic staff all across the world. And now, as a result of continual conversation with our clients, filled with honest input and thoughtful suggestions, I’m proud to say Interfolio has reached a milestone that we’ve been working towards for some time—the first comprehensive technological approach to supporting scholars and their institutions. In light of some pivotal technical developments recently rolled out to link our separate faculty technology modules, we now feel confident in saying that we offer what the higher education sector as a whole has long been saying (to industry, and to each other) that they need: the Interfolio Faculty Information System. For some time now, it has been clear that colleges and universities are deeply in need of a practical, modern set of transformative capabilities to address a variety of widely felt tensions between the institution’s academic mission and its existential necessities. This is a refrain we hear in our frequent conversations with a wide variety of institutional stakeholders, including chief academic officers, deans, academic technology leaders, institutional research directors, diversity and inclusion officers, university human resources management, and others on the administrative side of academic institutions. How does the number, type, and productivity of faculty in our various departments compare to those of peer institutions? Where are our measurable research strengths? Which approaches have been most successful in securing funded research? What is the likely impact of the upcoming cycle of P&T cases on budget requirements? At what points in the employment lifecycle are we experiencing the greatest losses of faculty from underrepresented groups? In what areas would additional or new efforts prove most impactful? But perhaps even more poignantly, we have taken note of the abundant complaints from hundreds of thousands of active scholars and students about the technological status quo, indicating that the practical tasks required of them when pursuing their own academic careers seem perpetually to present logistical headaches and inconsistencies. Virtually always, such complaints lead back to reveal an ill fit between universities’ chosen technology and the actual administrative processes being undertaken. Professional academics are fatigued from technical exercises in data and document management that they see as jumping through hoops, with only disparate and isolated benefits to them. And on the far end of the spectrum, some scholars have begun to express hostility and skepticism about the legitimacy of the data collection and use by the institutions that employ them. Until recently, when an institution worked with Interfolio, they adopted one or more separate modules that focused on certain key clusters of need: running faculty searches, conducting tenure reviews, storing confidential letters for past graduates, formatting faculty activity data into reports (or CVs), and so on. That was intentional, and the modular approach is not going away. But for the reasons I’ve touched on above, all of these somewhat mechanical considerations fall under a shared vision that could transform how scholars and universities interact: strategic ways to pair the actions that the scholar takes throughout their career with the actions that academic leaders take to study the institution’s activity. And at the same time, we released some new functional connections to allow data and documents to flow between the modules (including, for example, between our faculty activity reporting module and the individual’s Dossier). 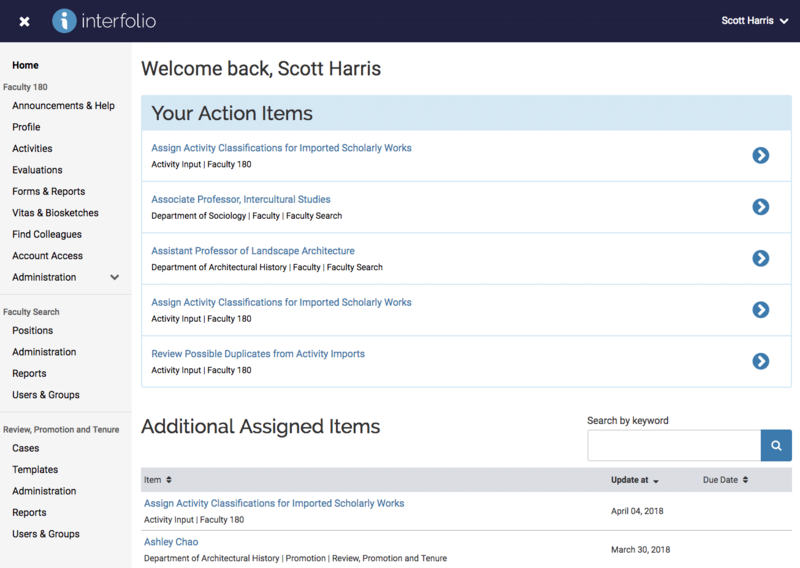 These product developments lay the first brick on the road in a new direction for Interfolio—towards an integrated platform focused on the full scholarly and career lifecycle of faculty members. Now an academic institution can account for the full path or trajectory of all its scholars, from graduate school through retirement, within an increasingly mature online environment that has been built in collaboration with higher education from day one. By focusing on the scholar and supporting their lifecycle events (e.g., reviews, promotions) and professional moments (e.g., biosketches, profiles, service work) in a central system, Interfolio can ease the individual and institutional burdens with transparency, equity, diversity, data collection and insight. Is more faculty-focused than an applicant tracking system (ATS), supporting deep artifact review, referee letter support and complicated shared governance work-flows. Is more committee-minded than a human resources information system (HRIS), allowing for deep understanding of the divots resulting from disparate inequitable processes emerging from differing departmental approaches. Is more action- and impact-focused than just faculty activity reporting (FAR), allowing for data to support the numerous faculty lifecycle events and professional moments of an individual, while supporting the insight and governance needs of the modern institution. Is more comprehensive than research information management (RIM) or current research information systems (CRIS), as it supports profile, teaching, service and professional data sets that comprehensively tell the whole story of the scholar, as well as the department, school, and institution. Is focused on the lifelong compilation of the scholar’s story by providing an enduring, transferable Dossier. This most recent development in Interfolio’s mission in higher education, the announcement of the Faculty Information System, is just the next step in a story with a lot of history already, and even more to come. Every day I’m inspired to see our seasoned team find new successes in offering the drivers of higher education—namely, scholars—a smart new category of technology worthy of their role.